It's a strange quirk of the computer music hardware market that when a 'generic' MIDI controller (ie, one that's designed to work with multiple DAWs and plug-ins) is announced, it tends to generate far less excitement than one created specifically for one application or synth. On a practical level, this doesn't make a great deal of sense - surely it's better to have a controller that's endlessly flexible rather than one that's bound to a particular piece of software? - but there's something about dedicated hands-on hardware that gets people interested. Take Novation's Launchpad, for example. This is undoubtedly a great product, but there's nothing more to it than a surface of backlit buttons. However, because it's designed specifically to integrate with Ableton's Live, it garnered a lot of interest right from the word go. Then there's the success of Native Instruments' Maschine. Had this been a software-only product, we're sure people would have warmed to it, but not to the same extent that they have in its software-plus-hardware guise. This isn't the first time software-specific controllers have been in vogue - products such as the Mackie-made Logic Control and Steinberg's Houston control surface were making headlines a decade ago. So, why are both manufacturers and customers attracted so much to the dedicated controller concept? 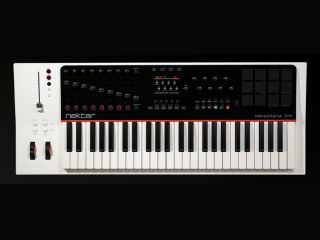 Nektar Panorama P4 is a dedicated Reason 6 controller that was announced last year and should be released soon. We asked Nektar's Niels Larsen if, by buying his product rather than a one-size-fits-all model, a user will get tighter Reason integration. "If you are trying to be all things to all DAWs, it's hard to deliver on your promise," he says. "The sheer workload required to create solid implementations when you have support for five or six DAWs to deliver is challenging. "It was always unrealistic for us to deliver broad support so we preferred to just focus on getting our Reason implementation right. Because of that, yes - I do think we've created a controller that integrates more closely with Reason." Given its closed but fully featured nature, a Reason-only controller does seem to make sense, but this isn't the only software that's benefiting from exclusive hardware. Another DAW that's recently seen a new range of dedicated controller hardware is Cubase. Steinberg's CMC range features six modular devices, and Steinberg Public Relations Manager Stefan Trowbridge thinks they have the edge over standard controller hardware. "Of course, users can also assign generic controllers to different control parameters in Cubase, but this is far from ideal," he says. "Take for instance the CMC-CH channel controller: it reflects all the controls found in Cubase's channel strip. No more and no less. With just this one controller, users can access VST instrument settings; solo and mute tracks; bypass EQs, sends and inserts; or freeze a channel simply by pushing the dedicated push-button. Just imagine how efficiently users might work using several of these controllers." Dedicated controllers for music production software are well and good, but what about hardware that's designed not for a complete music-making environment, but a single soft synth? That's what Touch Digital Controllers recently gave us when they released their handcrafted controller for GForce's ImpOSCar 2, but what inspired it to create such a niche product? "Having used synths since the '70s, we understand the importance of the way you play and engage with synthesisers: we recognise that there's a fundamental relationship between the user, the instrument and the creative process," explains Touch Digital's Richard Lawson. "We're also big users of soft synths ourselves and have for some time felt there was an artificial break with that 'connection' of playing a VI on screen and working hands-on with a hardware synth. So, we decided to see what could be done to bring the two together. "We believe this[software/hardware] combo is something very special and offers musicians the 'best of both worlds' by tapping into that vintage vibe in a massive and strangely emotional way." What, though, if the software gets updated and the hardware can't keep up? "If any new features were added that required a dedicated control, then the great thing about our controller is that the firmware can be updated to accommodate just about anything," Lawson reassures us. "Physical revisions can also be implemented if necessary." Nektar's Niels Larsen does concede that the ever-changing nature of software can present challenges, however. The most significant problem he's suffered so far was when the Kong drum machine arrived with Reason 5. "As all Reason users will know, Kong features 16 virtual pads; Panorama has 12," he explains. "Stopping the tooling process would have killed the project, so we had to make some decisions. "First we revisited and re-thought Panorama's drum pad menus, which resulted in many improvements, including the ability to access all Kong's 16 pads. The second decision was to implement field updateable firmware so we have the option to add features in the future." There's no doubt, then, that there's a market for controllers that 'just work' with specific software. Although generic models have helped to give back some of the tactility lost when we moved from hardware to computer-based system systems, the perception (and, in some cases, reality) that these are difficult to set up means that a certain disconnection has remained. "Controllers that are application-specific solve that problem because the hardware is designed for the job with the exact right amount of buttons and controls, all preconfigured," says Niels Larsen. "Some users have aired the idea of creating a controller for every device in Reason. That would probably be the ultimate controller experience for Reason, but it would also be a lot of hardware. Users want a controller that lets them experience the software with the immediacy of hardware. That's the philosophy we adopted for Panorama." On the subject of multiple controllers, we asked Richard Lawson if he can foresee a time when people buy different controllers for different synths, in the same way that hardware enthusiasts were happy to have a studio full of gear. "The question of owning multiple/dedicated units is complicated to answer, as MIDI controllers are not instruments that make their own sounds. So, people's perception of these in terms of value is different from that of say, a hardware synth," Lawson replies. "However, it's quite reasonable to say that some of the most-loved software instruments would benefit from a well-designed and high-quality controller, opening up the programmability to a new level." The key concept is this: a good software-specific controller can give an application or plug-in a level of controllability and desirability that, on its own, it just doesn't possess. A single one-size-fits-all device is the most cost-effective option, but for those who want to work with more creatively and aesthetically pleasing gear, a bespoke device (or even bespoke devices) will fit the bill even better. This article originally appeared in issue 173 of Computer Music magazine.